No 1 (Guards) Independent Company The Parachute Regiment (Gds Para Coy) was disbanded on 24th October 1975. The Guards Parachute Association (GPA) was formed immediately after the disbandment parade. In the words of our most prominent founding member, Major General Sir Robert Corbett KCVO CB formerly Irish Guards, ‘The Association is a means of carrying forward the very special comradeship and loyalty that all of us who had the privilege of serving in the Gds Para Coy felt towards one another, to the Company, their Regiments and the Household Division’. At the same time, we were irretrievably linked to The Parachute Regiment and Airborne Forces (ABF) and shared the ethos of Septum Juncta In Uno and Utrinque Paratus. This was exemplified by the wearing of the Parachute Regiment cap badge, against a blue-red-blue background and a maroon beret. All those who shared the experience of the 2-week ‘Hardening Course’, run by Gds Para Coy instructors and Pre Parachute Selection Company (‘P’ Coy) will forever be bonded. This bond is as strong today as it always has been, when the Association will sit down over 100 members to our 43rd Reunion Dinner on 3rd November 2018. The Association always manages to arrange a speaker of some note to regale us with classic stories of their lives. Last year we had Algy Cluff, a noted Grenadier and very successful businessman. 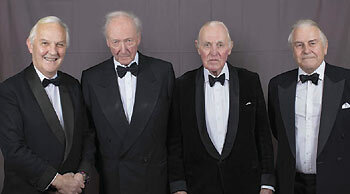 Before that we had Lieutenant-General Sir Hew Pike who commanded 3 PARA in the Falklands and over the years such notable leaders as Field Marshal Lord Guthrie, General Sir Mike Rose, Major General John Holmes, Colonel Sir David Stirling, General Sir Peter de la Billière and, of course, our Patron, The Prince of Wales. All are influential leaders, most are Guardsmen and PARA, which clearly shows our historical links with the Household Division and ABF and the esteem in which the Association is held to the present day. 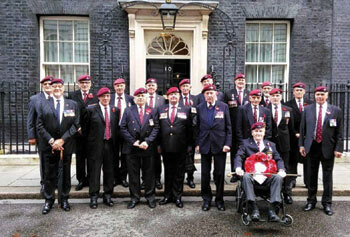 The Guards involvement with ABF is well documented from Lieutenant-General Sir Fredrick ‘Boy’ Browning and Colonel Sir David Stirling to the Guards Parachute Battalion that saw active service in Palestine after the Second World War; today we have The Guards Parachute Platoon serving with 3 PARA. The Gds Para Coy truly was a unique outfit that saw service in such places as Borneo (in the SAS role), Suez, Cyprus and Northern Ireland. Latterly, the Company were the Pathfinders for 16th Parachute Brigade and continued to employ all the skills inherited from their operational tours with the SAS in Borneo. These included operating in 4-man patrols within the 16-man troop to find, mark and defend the main assault DZs for 16th Parachute Brigade. The skills required to operate in this environment were those of the signaller (Morse - how those who are only used to satcom will laugh at that form of communication, but it worked, and we always got through), medic, linguist, demolitions, and lead scout. Of course, exceptional fitness and navigational skills and the ability to operate in small groups over an extended period without resupply were essential to these types of operation. This advance force work stood us in good stead when, on disbandment, many members of the Company went on to join G Sqn. SAS selection held few surprises for those who passed and was once described by one as the best organized walking holiday he had ever been on. Of course, it was the Gds Para Coy who, after their tours in Borneo, were invited to Hereford to form G Sqn and that link came full circle with the last members of the Company taking the opportunity to join 22 SAS. Last year was a momentous year for the Association when we saw our long-serving President, Major The Lord Patrick Beresford, formerly Royal Horse Guards, hand over duties to Colonel Simon Falkner OBE, formerly The Life Guards. Lord Patrick has steered the Association for many years and it is in no small measure, due to his hard work, that we are still a thriving and successful Association that is proud of its heritage. Colonel Simon has the distinction of being the only Life Guards officer to have served with the Gds Para Coy. We look forward to many successful years with him as our President. Major Dave Morgan, formerly Welsh Guards and Pioneer Corps has handed over the Chairmanship to the author. So although there have been some changes we are still a going concern and, of course, always on the lookout for new members. Any Guardsman who has served with ABF is eligible to join the Association and a warm welcome is assured for young and old. All that is needed is a bit of airborne initiative.